Human nutrition in the developing world covers the most important nutritional problems of developing countries and suggests appropriate programmes and policies to address them. It provides sound science-based information on food, nutrients, the causes of malnutrition, nutritional disorders and their prevention. It emphasizes three prerequisites of good nutrition: food security, good health and adequate care. Special stress is given to applied and multidisciplinary approaches for the alleviation of malnutrition. Food-based approaches are emphasized as the only sustainable way to improve the nutritional status of all. In developing countries better development of agricultural resources can improve food supplies, employment and incomes and thus enable adequate diets. 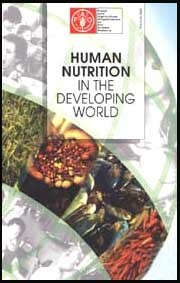 Human nutrition in the developing world will serve as a comprehensive introduction to nutritional problems in developing countries. It is also designed as a useful reference for workers in agriculture, health, education and other fields who are seeking to promote simple, practical and affordable actions to solve nutritional problems in developing countries. The publication will be especially useful for those working with rural populations.